We are pleased to offer all OSHA Hazwoper Online Training Courses at discounted rates! You can take any of the Hazwoper series of classes online with the click of a button! This includes the OSHA Hazwoper Online Annual Refresher course. 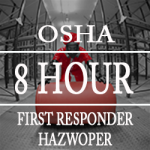 The OSHA HAZWOPER Online 8 Hour Annual Refresher Course is required by OSHA for those individuals who might experience exposure to safety or health hazards. The course complies with requirements set forth by OSHA in 29 CFR 1910.120. The online course meets all Federal & State OSHA HAZWOPER Refresher Training Requirements. 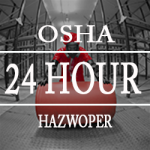 The OSHA HAZWOPER Online 24 Hour Training Course is typically the first course that safety professionals require if you have the regular opportunity to be exposed to hazardous substances. This is the prerequisite course for all HAZWOPER training. You must have taken this or the 40 Hour Course below in order to qualify for Annual Refresher Training. 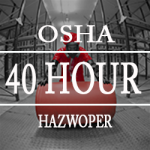 The OSHA HAZWOPER Online 40 Hour Training course provides comprehensive training on how to perform post-emergency response activities and cleanups at industrial sites, Superfund and RCRA corrective action sites. Training includes hazard recognition, exposure limits and risk evaluation for chemical and general site safety concerns. ALL OSHA HAZWOPER Online training does not allow participants actual experience and ability to handle the equipment available to the HAZWOPER worker. On-site, job-specific equipment training provided by the employer is essential to fulfill the HAZWOPER requirement. Your employer will work with you to make sure that you receive your full certification by providing the hands-on instruction necessary. Hazardous Waste Operations and Emergency Response (HAZWOPER) is a stated set of guidelines produced and maintained by the Department of Labor Occupational Safety and Health Administration (OSHA) which regulates hazardous waste operations and emergency services in the United States and its territories. With these guidelines, the U.S. government regulates hazardous wastes and dangerous goods from inception to disposal. These courses generally conform to the the standard OSHA CFR 1910.120.